We have gotten several of these throws. Great as beach blankets, picnic blankets, and a great pop of color on the couch! LOVE them! This blanket is just gorgeous and is nice and soft. It also arrived faster then expected and when I had an issue with my credit card, the customer service folks couldn't have been nicer or more helpful. This was my first time shopping with Serrv, and definitely will again! As stated by another reviewer, the throw is not as described. When I saw the throw online I was thrilled with the beautiful vibrant hues of blue, green and purple. When my order was placed, I specified in the comments I wanted blues, greens and purples with minimal golds/yellows. What is received is one in primarily golds/yellows with the desired colors being very muted. While the work on the throw is very well done, unfortunately, I cannot use it. I really wish someone had contacted me after noting my specific request, to let me know it could not be accommodated and the order could have been cancelled. Owner Response: We are sorry to hear that you are disappointed. This is one of our best-selling items. Each one does vary - which makes them one-of-a-kind, and we are not able to accommodate specific color requests per order at this time. We will emphasize again to our artisan partners that the blue-green hues need to be primary. 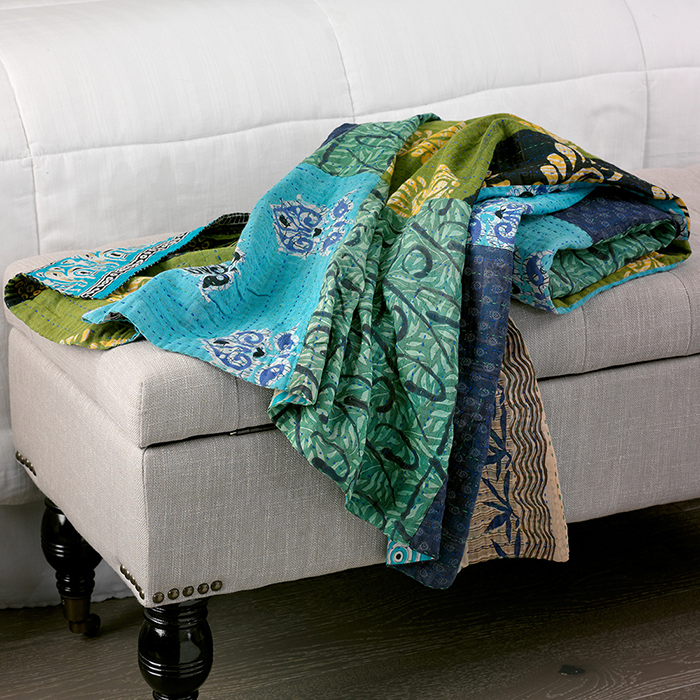 The Kantha throw was described as 56" in squares of blues and greens with accent embroidery. The small catalog photo of the folded throw shows it as clearly blues in hue. The throw which I received was primarily yellows and orange. While there were 4 of 16 squares of blue, the overall appearance was certainly not blues and greens. As it was intended as a gift and had been selected specifically for the colors, I chose to return the throw. I have purchased from Serrv for decades and never been disappointed in a product. The workmanship was excellent and typical of all Serrv products I have purchased before. I was sorry to need to return this one exception. For quality the product rates high, but the colors are not as described. Owner Response: We're sorry to hear this didn't work out for you. It should have a majority of blues and greens, but every one varies and it sounds like this one varied too much. First I bought the Kantha quilt to use as my summer bedspread. It is gorgeous and just the right weight. Then I bought this Kantha throw to use in the living room in the winter. Again it has beautiful soft fabrics and is perfect to cuddle up in while reading a book and sipping tea. I just received my throw today, and I couldn't be more pleased with this purchase. It is beautiful! I really lucked out with the fabrics/colors as every one is lovely. It is mostly a mix of blues, purples, and greens. It appears to be 2 layers, and there is a tastefully done patch. The color description was deceptive. Although it had some blue and green the overall color on the one side was gold/yellow. My ordinary customer did not like the color at all. Fortunately it suited another customer and I sold it the same day it arrived. Owner Response: We are sorry that this one didn't include blue and green patches. Every one is unique but those colors should have been part of the throw. Glad it sold for you though!